In this post, I felt a certain tone of Washington Post's sarky point of view as usual. They'd like to picture that the Japanese officials, a kind of historians, and some nationalists DENY any Japan's fault. " Oh yeah, they're Japanese right wings. " " revisionists " , most of them would consider that it's just a nonsense. They'll never go beyond the background of this issue instead of being a bit more insightful. It may be much easier to be a good person and at the same time actually being trapped a cheap trick of politically correctness. But when I take a good look at this global "comfort women" phenomenon, I can't ignore its awkwardness. And I just really wonder. Why they, McGraw-Hill side historians, stick to the 200,000 comfort women victims so much? Are confort women supporters really the claimers who support poor women? Not a bunch of demanders? It's time to start to take a look them pretty carefully and think about it also. Now Japanese professors, led by Hata, are taking action, writing to McGraw-Hill to contest the textbook’s statement that as many as 200,000 women were forcibly recruited to be comfort women for Japan’s imperial army. Hata says the real number is about 20,000. They also take issue with the claim that the women were “a gift from the emperor.” “This is too impolite expression for a school textbook, which defames the national head,” the Japanese letter says.
" 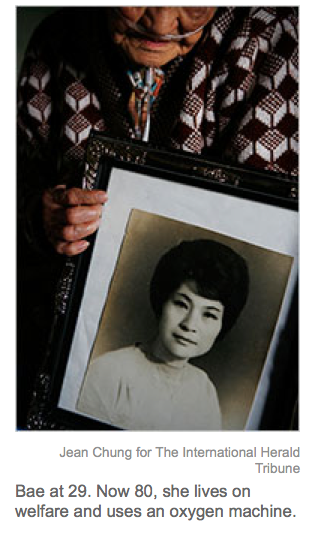 The Background of South Korean Comfort Women Issue "
Therefore, we greatly appreciated those unnamed women who served the nation along with our soldiers. The book was reported by an editor named Takashi Uemura of Asahi News paper on their paper several times. Japanese government wanted to move ahead and keep the past in the past that was the reason for issuing the apology in the Kono statement although we had treaty in 1965 between South Korea and Japan to finalize any further claim, as you can see, that did not work eiher. He explained to me that he has been sending over 20 bills in 34 years related to human right abuses to the UN human rights committee but none of them were accepted. ?This is my perspective of this issue.